Concentrating on the melody or harmony of a piece is a great exercise for when you have to do both. 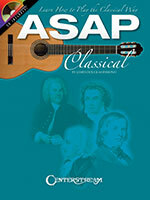 For this book, author James Douglas Esmond has chosen a dozen pieces out of the classical domain, which are not found in the standard guitar repertoire. 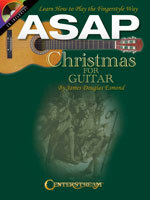 The pieces in this book start off fairly easy and progress to more challenging ones for intermediate guitarists. One guitar is great, but two is twice as nice � and working with other musicians is great fun. 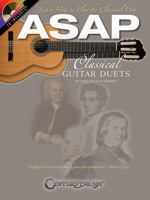 So get together with another guitarist and have a wonderful time discovering these guitar duet pieces! The accompanying CD features 24 tracks. 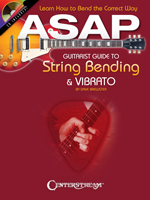 String bending and vibrato are two of the most popular guitar techniques used in all musical styles, yet for intermediate players, gaining control of them might seem overwhelming. This book outlines some of the most common bending and vibrato techniques and licks, teaching them in an easy-to-digest manner to help you see and hear how to use them with confidence in a musical context. Contains more than 150 helpful examples! 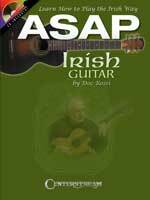 This quick guide to flatpicking Irish traditional music was written by Doc Rossi, a well-known citternist and guitarist in both traditional and early music. He's created this book for intermediate to advanced players who want to improve their technique, develop ideas and learn new repertoire. Starting with the basics of technique and ornamentation in traditional music, Doc then goes directly into the tunes, in standard notation and tab. Focusing on traditional music from Ireland, Doc has also chosen tunes from England, France, Flanders, North America and Corsica to reflect the guitar's broad range. Right- and left-hand techniques, ornamentation, arranging and other topics are taught through the tunes themselves. Doc has developed his own tuning for playing traditional music, and this book shows you how to use it. His tuning makes it easy to play tunes in all the important traditional keys without moving a capo around or having to negotiate difficult position shifts, while at the same time providing a number of open strings and other possibilities for playing your own accompaniment. An audio CD with all of the tunes played at medium tempo is included.